Discussion in 'Guides, Mods, and Upgrades' started by MyMakibox, Apr 6, 2018. So I've got these up and running on the BigBox, and wanted to see how much interest their is in a writeup. moshen and Paul Begley like this. It would certainly be good to have a write up for the community. I've thought a few times about doing this mod myself but have to admit that at the moment I'm going to curb my BigBox updates until the new tool-changing beast is available as I have put my name on the waiting list. I think it would be great if you did a write-up. I want to do the upgrade but the information is so scattered it makes it difficult to attempt without putting my machine at risk of being out of commission. OK - I'll write a few posts and then compile it into one howto. * Like all the recent TMC's, they provide quiet or silent operation. * Unlike the TMC2100s, they are smart in a way that benefits 3D printers. [edit to incorporate DC42's comments] They provide software control and monitoring. They can intelligently set and tune current, detect overheating before problems arise, detect movement problems from missed steps and so on. Together these mean fewer failed prints. * They provide "sensorless homing", meaning the printer can detect that the print head has encountered an obstacle, instead of requiring an end-stop to be activated. The main benefits are that you won't get the damage from the print head trying to force its way through obstacles, and printer wiring can be simplified. * TMC2130s on different axes provide different benefits. The obvious ones are X and Y, where the quietness, control of heat, current and sensorless homing are big advantages. On the Z-axis, Marlin provides a mechanism to level the bed left-to-right. On the extruder, they may be useful in identifying extrusion problems that cause missed steps. I only have X and Y for now. * The key to an installation is preparation. The TMC2130s are not plug-in replacements for other steppers. You need to be enabled with firmware and wiring to be in place before they will move the axes at all. Most of the preparation is hardware and firmware that can be done away from the printer - it only takes a minute to replace the old steppers, connect wiring to RUMBA and flash the firmware. * Marlin support for the TMC2130s is recent and not complete. There will be additional functionality from future software upgrades. * Most of the online support is for RAMPS boards. My how-to will focus on the RUMBA which came with your BigBox. * Duet users will secretly be fuming with envy. The TMC2660s on are Duet are fantastic, but more general purpose, and lack a couple of the 3D-printer features of the 2130s. Be careful not to gloat too much - Duet users paid a lot for their kit. * I got mine here for about US$10 each. * The TMC2130s come without the debug pin. A connection to this pin is required for sensorless homing. You'll either need to solder wires to their circuitboard, or solder in a pin for jumper wire. So you'll need a soldering iron etc. Or you can choose to use the TMC2130s without sensorless homing for now. @MyMakibox, a couple of corrections to your post. First, the TMC2130 was not made specifically for 3D printers. It has no 3d printer specific features. The v1.08 data sheet lists applications as "Textile, Sewing Machines, Factory Automation, Lab Automation, Liquid Handling, Medical, Office Automation, CCTV, Security, ATM, Cash recycler, POS, Pumps and Valves". Not a mention of 3D printing at all. Perhaps you were thinking of the TMC2208? Second, the TMC2660 provides almost exactly the same feature set as the TMC2130 apart from stealthchop - in particular it provides over temperature warning, overheat protection, software settable motor current, configurable chopper parameters, spread cycle, stall detection/load monitoring, microstep interpolation, and coolstep. 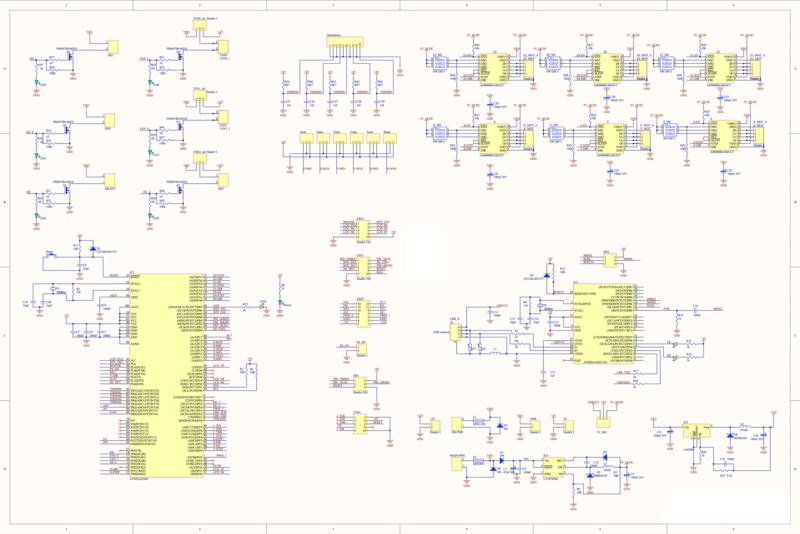 In fact when we designed the Duet WiFi we considered the TMC2130; but we rejected it because it can't carry as much current as the A4982 that we used on previous Duets without overheating. It can't even carry as much motor current as the widely-used A4988. Whereas the TMC2660 that we ended up choosing can carry a lot more - enough even for some types of Nema 23 motor. The TMC2130 is certainly a nice driver, but just like the TMC2100 before it, to get the best out of it you need to pair it with motors that don't need a lot of current. A rated current of 1.0 to 1.3A should be ideal, or 1.5A at a push. Prusa has his own motors wound (like E3D does) and I have no doubt that he specified the winding details to be a good match to the TMC2130. @dc42 : my comment was meant to be a tongue in cheek. But thanks for the corrections! The BigBox group is filled with users who are ridiculously happy their Duets and the expansion boards, and have had them for a while, and sing their praises. It's a big accomplishment for you and your team. But for those of us who aren't up for taking the plunge, the TMC2130s now provide the stepper benefits at a fraction of the price and with a much simpler upgrade path. Stealthchop and the capability to dynamically switch modes are the major extra features of the 2130s -- but there are other minor differences like "passive braking" for example. I take your point about the sheet, but would say that's quite inconsistent with the marketing and online demonstrations which seem very 3DP focussed. Yes Trinamic seems to have discovered 3D printing about a year ago and shifted their marketing focus. The TMC2208/2224 seems to be aimed largely at 3D printing and is aggressively priced. It doesn't have stall detection, but I think that's an overrated feature anyway. Only very recent versions of Marlin support the TMC2130. SENSORLESS_HOMING, X_HOMING_SENSITIVITY, Y_HOMING_SENSITIVITY only matter if you plan to connect the additional wiring from the stepper modules to the endstops (requiring soldering) and there's no significant benefit yet. They will be much more useful once the code supports remedial action after detecting missed steps. I'll write up a more detailed guide later. What pins would you use if you were doing all six TMC2130? Where did you connect Diag pins? Where did you connect SD0, SCK SD1 on Rumba? So having a hard time with it. OK worked out the pin problem. 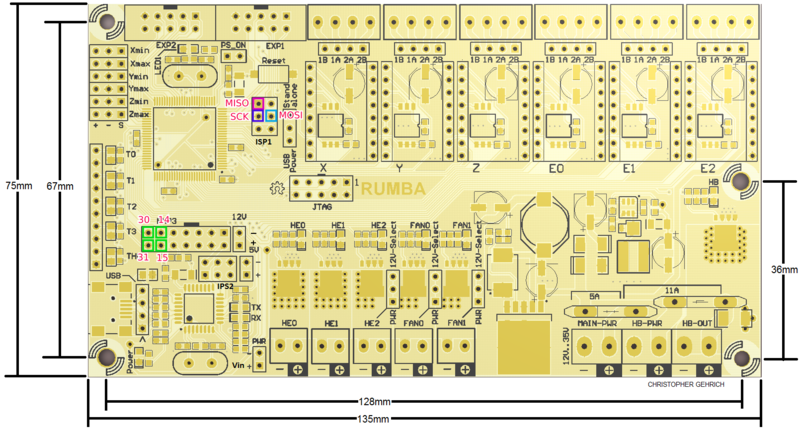 The diagram linked above has the RUMBA pins - essentially you connect all the stepper's MISI together, all SCK together and all MOSO together - and then connect those to the RUMBA ISP1 pins shown. Each chip select pin is connected to one of the pins on the EXP3 header, on the left of the RUMBA. 4 are shown (30,31,14,15), and it sounds like you want to find another two. The debug pins connect to the corresponding (X-min, Y-min, Z-min) end-stop "S" pins, on the upper left of the RUMBA. Where do you connect extruder debug pins? What would you do with 3D Touch? or debug pin wire? I'd connect the Z debug to Z-Max, since the only use I know for it is M915. Your BL-touch can stay connected to Z-Min. I wouldn't connect the extruder debug since there's no Marlin support for them yet, AFAIK. < ErrorPrinter halted. kill() called! I didn't encountered this issue. < Error rinter halted. kill() called!